#r3fest 2014 took place at the Slade Research Centre on 26 June 2014. It was a runaway success that was reported in the Guardian. Funded by grants from UCL and AHRC, the Festival was organized and curated by Dr Kai Syng Tan and Dr Alan Latham. Around 50 people from 30 institutions (including Harvard University, Glasgow University and UBC; running store Run and Become; social enterprises and charities Streetscape and Goodgym; running club Highgate Harriers; creative studio PhilBeat from Singapore) and 25 cities (including Melbourne, Milan, Vancouver and Grenoble) congregated at Bloomsbury to examine running, not just within its traditional contexts of sport or medicine, but as an arts and humanities subject. The innovative programming set out to provoke debates and create unexpected meeting points. People from diverse disciplines (including biomechanics, paleoanthropology and fine art) presented keynotes, shared ‘live’ performances, tours and workshops; senior academics intermingled with up-and-coming performance artists, established filmmakers and community leaders. Parallel activities included a meditation session by ultra-runner Devashishu Torpy (Sri Chimnoy Centre) and a talk by London Olympics medic Dr Courtney Kipps (UCL) on injuries, thereby presenting participants with the dilemma of science versus spirituality. Praises came forward not just because of it was a pioneering event to scrutinise running, but also for its bold approach. The Guardian reported that ‘other conferences could take a leaf out of #r3fest’s book’. Dr Derek McCormack (Oxford, Geography) called it a ‘really fun experience’, while Mr Torpy concluded that he has ‘come away very inspired.’ Sarah Petts (SOAS) even ventured that this was ‘[p]ossibly the best conference ever’. Scroll down for gallery, list of partners and friends, feedback and commentary, and our thank you and credits for photographs. ‘Many thanks to you and Alan for organising such an interesting event. It was really fun experience to be involved with, and I think you got the tone, timing, and mix of speakers/activities/displays just right. After going to this kind of event I¹ll find it even more difficult to summon up the enthusiasm for a more conventional academic conference. And 8-minute slots are the way to go.’ - Dr Derek McCormack (Oxford University) who spoke at the afternoon Talk Fest and responded to the second keynote. 'I loved the atmosphere and feel of the Festival and your conversation with Ivo Gormley [...] about his film was excellent. You leave me and my Camden colleagues with lots of ideas for the future.' Mr Peter Twist, professional London tour guide. 'I loved the workshop: its variety and humour especially and can’t thank you enough for organising it.' Dr Allen Abramson (UCL Anthropology) who spoke at the morning Talk Fest. 'I thought it was all-round excellent and I thoroughly enjoyed it. There were lots of conversations and ideas that promise much for the future.' - Dr Andrew Filmer (Aberystwyth) who prepared a fun and thought-provoking workshop for the Festival, and who had successfully smuggled a treadmill all the way from Wales to Central London - hand-carrying it!! - so that his student Live Marianne Noven could run a performance on it. Can we nominate him for The Most Dedicated Teacher Who Walks/Runs The Talk and Goes To Great Distance To Support Student's Work Award? 'It was probably the best conference I've been to 🙂 Wonderful atmosphere and loved the soup!' - Ms Megan Tennant, attendee. ‘Thanks once again for organizing Kai! It was an action packed day and I learned a lot about how some really creative and smart people are researching and performing running. […] I also hope to follow up with a few people as the day flew by and I would love to hear and read more about particular lines of inquiry presented during the day. […] I'm also really looking forward to hearing from the Running Research Network too, and hope to contribute to it as best as I can.’ - Mr Gavin Weedon (UBC) who shared a poster and had come (run?) all the way from Canada. 'An inspiring and thought-provoking day.' - Dr Dave Hindley in his report. 'Thank you for a really super day, I really enjoyed it.' Ms Gemma Price (UCL Anthropology) who displayed her spectacular skeletons in public at the show! ‘A fantastic festival- so much packed into one day- really productive and a great time!’ - Dr Veronique Chance (Anglia Ruskin), who shared her artworks, spoke and helped set up the space as a volunteer. And did a 'live' strip-tease in front of the crowd. ‘The event was really fantastic and a privilege to be a part of […] I'm sure the consensus is that it was a resounding success and hopefully will catalyse future events and network activities.' - Mr Simon Cook (RHUL), who ran a debate and helped set up the space as a volunteer. ‘Thank you for inviting me to the festival. I really enjoyed it, and have come away very inspired.’ - Mr Devashishu Torpy (Sri Chimnoy Centre), who talked about the relationship between running and meditation and ran a meditation session. ‘Talk Fest I & II which I attended were interesting, varied and fun. I loved the format of the day […] it was great to get out of the usual stuffy seminar format, and bring together artwork, performances, running tours, film screenings and presentations in an interesting way. I found the afternoon Talk Fest particularly inspiring, I thought it was a strong and varied line-up.’ - Ms Krisztina Lackoi, Research Coordinator, UCL Museums & Collections. ‘The day gave me a lot to think about.’ - Ms Penny Andrews, who gave a spectacular performance at the morning Talk Fest that shook (and woke) us up. ‘Glad to hear your festival was a run away success!’ - Mr Balavan Thomas (Run & Become) Chi Running instructor who was running 6000 miles in Czech when the RUN RUN RUN! took place, and who had been most supportive of our effort throughout. What you see on the left are the lovely emails that you have sent me .... but it is I who owe you a massive THANK YOU for coming by and participating in the inaugural RUN RUN RUN! 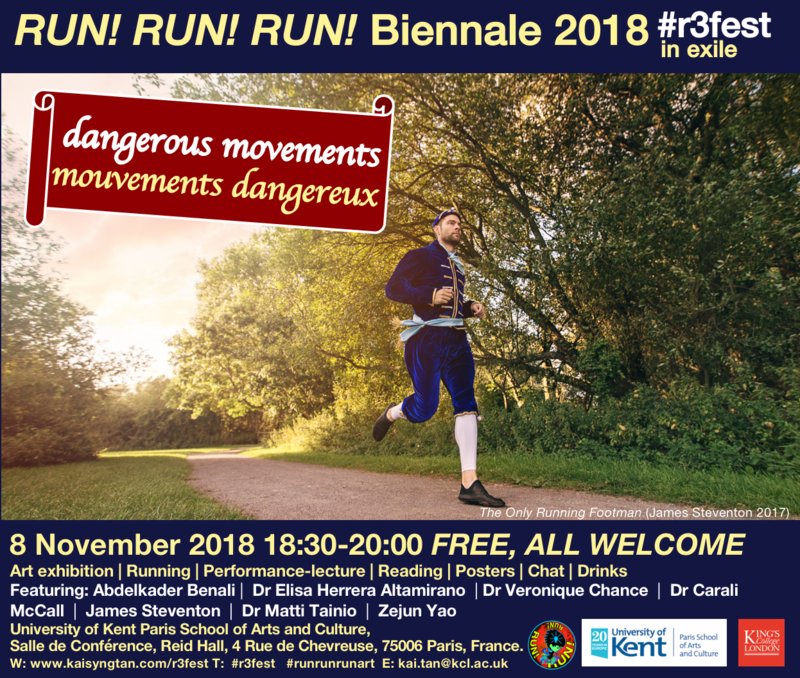 An International Festival of Running 1.0 #r3fest! Around 50 of you from approximately 25 Higher Education Institutions representing more than 20 disciplines (including 6 from UCL alone) and 9 social enterprises, charities, sports or creative companies/collectives joined us on 26 June 2014 at the Slade Research Centre, Central London. Congratulations for making the wise decision to come (to this instead of other smalltime festivals like Glastonbury). It was (weird and) wonderful to see you in person for our first real-life date, after months of online communication. I hope that we did not disappoint. Several of you have travelled from afar and made effort to join us. We thank you and we hope that the trip has been worthwhile. Without you, the festival would have remained a concept, and remained ‘Oh I wish there were such a gig!’. With you, such a gig happened and materialised. The day was full-on with the large buffet spread of activities / papers / performances / artworks. I hope you had not come away with indigestion - as that was just an appetiser, a teaser. You have (possibly) made history, and open the doors / windows / catflaps for More More More. Hopefully the Festival should have legs / mileage, with your continued enthusiasm via the Running-Cultures Research Network on JISCMAIL for instance, or even a next gig in the form of exhibitions, perfomances, or runs, etc etc etc. In other words, there should be more dates to come. These images were taken by Richard Wright, Simon Cook, Robin Kang, Sami Ramzi Chibane and Kai . (To download the images, right click and 'save'). There are also images and comments on Twitter by searching #r3fest. A good number of them were by the adorable Professor Anson MacKay. I have added a couple of screenshots here for the anti-Twitterattis. And do check out 2 articles, one by Dr Alex Lockwood in the Guardian Running Blog Alex is Senior Lecturer in Journalism, Faculty of Arts, Design and Media, University of Sunderland (and has just told us that he came 7th in the Vancouver Canada Day 10k, a very hot and hilly run, in 41:36. CONGRATULATIONS!). The other is by Dr Dave Hindley. Dave is Subject Leader for Sports Education, Sport, Health and Performance Enhancement (SHAPE) Research Group, Nottingham Trent University. What are your thoughts of the day? Tell us - and let us know if you'd mind if we publish it with your name. Good feedback can help us get funding to make the next Festival happen, and to make it bigger/better/badder/madder. Or, have you captured great photos to share? Fill up the comments box below, tweet or email me. To bad I only just saw this! Hope there will be a 2.0!